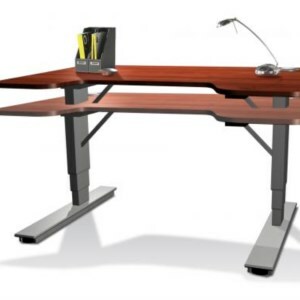 The latest improvement in office desks ergonomics is the advancement of electronically controlled sit and stand desks. First, there were the Stand Up only desks. The most basic and cheapest, but also the least flexible table. If you wanted to sit down, you'd have to move everything on your table to a sit down table. Then came the manual hand crank sit and stand desks. And these manual sit and stand tables work, but aren't a very elegant solution. There's a handle sticking out somewhere on the table and you have to manually crank it. Finally, I am beginning to see the electric sit and stand desks in the workplace. With the push of a button, these tables smoothly move up and down. Some of the fancier models even come equipped with memory settings, which I think are a bit overkill. But the number one reason sit and stand desk are not as widespread as they should be is price. The sit and stand tables start at around $600 and go up depending on feature. Some of those prices don't even include free shipping. Below are websites (not resellers) that directly sell to you sit and stand desks. Stand Desk - the company was a fully funded kickstarter campaign in May of 2014 with $649,244. These sit and stand desks start at $508.99. Varidesk - these aren't full table solutions, but rather add-on's to any existing desk. They appear to have great reviews, but will give your desk a messy feel with all the hardware. It is much more affordable, starting at around $275. NextDesk - A fancy website, higher quality surfaces, but also a higher price, $1497. They have many desk configurations to choose from if you need flexibly, but be prepared to pay more. Ikea - The brick and mortar store also created a BEKANT desk with sit and stand abilities, but had to temporarily remove it due to packaging problems. But keeps your eyes out for that, as I hear the pricing is less than $500. See a Gizmodo review. These three sites are examples of how pricing on sit and stand desk can vary. The good news is that as more companies begin creating these tables, pricing should come down. For the time being, there are instructions online for those handy who want to build their own desks. Building your own desk isn't quite as elegant, but for those who are handy, this may be the perfect solution for you. Find the instructions at Instrutables for sit and stand desk. Other solutions include buying a stand up only desk, but get a tall chair for when you want to sit. For now, I'm planning on holding off purchasing an electric sit and stand desk until they hit $300. Anything more than that for a desk doesn't seem worth it.